We have officially been in our house for a month! Before we made the offer on the house we had walked through it once for a total of 15 minutes (maybe?!). We instantly fell in love with it from pictures online and had an immediate good feeling walking in the house (like it was ours already!). After putting in our offer and it being accepted, we then walked through the house briefly on inspection day and again 24-hours prior to moving in for the final walkthrough. Basically, before our first box arrived we had spent less than an hour in the house. Crazy?! We loved the house, but there was also a lot about the house we still didn’t know about. I told Geoff prior to moving in that their definitely will be things we find out and learn about the house and say, “oh, I didn’t realize that was there” or “man, I wish this was different” but there will for sure also be times we say “wow, check this out! or “no way, look at this!” Prior to moving in, my hope was that the latter two sayings were said more than the previous ones. I hoped we found more things we were excited about than disappointed with and my hope has been more than exceeded!! We fall in love with the house more and more every day. 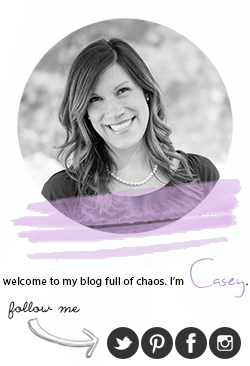 I follow many bloggers that are also just purchasing new homes or even building new ones. They all are fantastic at DIY projects or decorating rooms of their beautiful, new homes. They have post after post how they refinished the floors (luckily that didn’t need to be done!) or are sewing curtains for the window panels or they are showcasing the beautiful, new décor throughout. I have been thinking about myself lately and what I want to “showcase” within our home. At this point most all of the rooms are still to-be-completed, I don’t do DIY projects and we have already talked about my lack of interior decorating skills. So what do I have to offer on this little blog that could be helpful to you folks out there?? One thing I am really good at is organizing. I have been told many times that I should be a professional organizer (not sure that is really a profession or something people would pay for but eh?). I have always had a knack for organizing and remember as a child rearranging my room just so that I could clean it from top to bottom and reorganize things to a better place (slightly OCD?). As the years have progressed and two kids have been added to my life I am not as OCD organized as I would like to be, but it is something I am still good at. So, moving on from the L-O-N-G introduction to this post, I am going to tell you Seven Easy Steps to an Organized Move. Set a Move Date. One date. Meaning, one date to pick up everything from the old house and drop everything at the new one. The same day. It is very hard to keep things and your household organized when you choose to pack a few boxes here and there and take them over as you pack, spreading your move over a week or so. Next thing you know you will be getting ready for bed one night to figure out your toothbrush or your glasses are at the house you are not currently at. Start Early. Give yourself plenty of time. If you begin packing the week before your move and you have enough stuff to fill a 24 foot U-haul, it will never happen in an organized way. If you begin a few weeks or even better a month before the move, you will have plenty of time to (1) leave it behind! No hoarders – donate it or trash it! and (2) pack room by room, keeping the contents of each room in separate boxes. This will eliminate confusion and save so much time when unpacking. Color Code. I know you think I have officially lost it at this point, but trust me, it will make moving in so much easier. I have done moves in the past where I just write the room name on the boxes instead of color coding and they tend to end up in various rooms throughout the house. So, what do I mean by ‘color code?’ I picked up an assortment of colored duct tape prior to our move, assigned each room to a color and went on marking! It makes for no confusion when moving day comes. When I pack boxes I not only write the name of the room on the box but I also like to mark down the contents that is in the box. This can make for a lot of markings, but trust me, it’s worth it! Pack the Essentials Last. The kitchen, the bathroom, the kids essential toys. You get the point. Have Plenty of Supplies. I am the type of person that gets a burst of energy around 10:30 most nights (if I make it that late – most nights I do!) and so my life and work usually begins at that hour. No one wants to be in the middle of packing and "on a roll" to be out of boxes or tape or wrapping paper. Begin collection boxes from local merchants early or purchase them from moving companies, which most will accept any unused boxes as a return. Stock up early! Enlist Any Help You Can Get. The more help the faster the move will go. Enlist with packing, babysitting young children, moving boxes on move day. Moving is hard and any help offered take! Make a Survival Kit for the first night (or week). This should include items to get you through the night so you don’t have to find that one box amongst a hundred with your toothbrush! Helpful items to include might be: non-perishable food, paper plates, plastic utensils, bottled water, towels, sheets, toiletries, toilet paper, pen and paper, and a change of clothes (or couple) for every one. Watch out for Part II: How to Purchase a House without a Realtor (I’m telling you it’s easy peasy!!). We just helped our first set of friends make their first home purchase sans any realtors. Thanks for putting these tips together, I'm going to Pin it on Pinterest.